This Event May Sell Out! 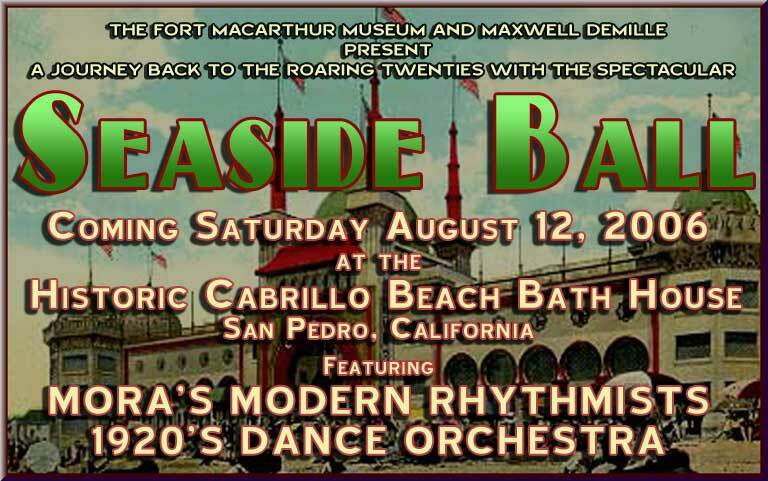 Constructed in 1932 from a Mediterranean style design by engineer, David Berniker, THE CABRILLO BEACH BALLROOM is the last remaining beach ballroom/bathouse in Southern California, and was at the end of the famous "Red Car" streetcar line that ran from Los Angeles to San Pedro, then out to Point Fermin. In the days before everyone had automobiles, folks from the central city would travel to the beach in this manner, and patronize the Bathhouse, where they could pick up a swimsuit and a towel for a ten cent rental fee and enjoy a day at the seashore. The evening would offer delighful musical entertainments in the upstairs ballroom, cooled by refreshing sea breezes. The 26,000 square foot building incorporated shower rooms, life guard facilities, restaurant for the beach-goers, and the famous upstairs dance hall boasting a spectacular view of the Pacific Ocean. 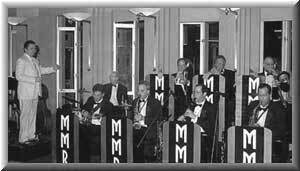 MORA'S MODERN RHYTHMISTS As the great Swing Era of the 1930s and 1940s fades further into history, we look around and realize that there aren't too many people still alive anymore who can say they were active participants in that musically vibrant era. Gone are the likes of Benny Goodman, Artie Shaw and Benny Carter. The exploration and revival of their music is the work of the 12-piece swing band Mora's Modern Rhythmists, based in Los Angeles. Formed in 1994 by pianist Dean Mora, the band utilizes period arrangements and record transcriptions of the original Jazz and Swing Era charts, concentrating on the Hot Jazz and early Swing periods of 1927-1937. They are active in the local club scene, and have performed in many historical venues, including the Hollywood Palladium, the Orpheum Theatre, the Wiltern Theatre, and the Hollywood Roosevelt and Biltmore hotels. KAYRE MORRISON Known affectionately as "The Canary of Song", this talented vocalist also has over 60 stage productions to her credit, Kayre is well known to Southern California theatre audiences and has appeared in numerous films and television programs. She also runs a business recreating vintage dresses. Not only does she sing, but sews, too! Visit Our Dancing Daughters (named after the 1928 movie starring Joan Crawford).She has created many of the dresses she wears when singing with the band! 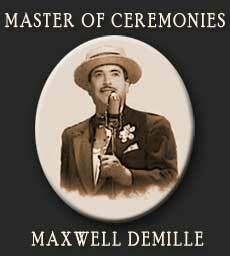 She can be seen in the Maxwell DeMille production BROADWAY CONFIDENTIAL. DAMON KIRSCHE Broadway appearances include Ziegfeld Follies of 1936, Strike Up the Band and Sweet Adeline with City Center Encores!. At Carnegie Hall, Damon appeared as Lowell Pennyfeather with Jon Lovitz and Brent Barrett in Very Warm for May and in Tip-Toes, recently released by New World records. Off-Broadway credits include the Lyrics & Lyricists series and Die Dreigroschenoper at the Kaye Playhouse. Regionally, Damon appeared at the Kennedy Center in The Impresario (Mr. Bluff); at Sacramento Music Circus as the Prince DeLong opposite Susan Egan in last season's The Unsinkable Molly Brown, and previously in Into the Woods (Rapunzel's Prince) and Show Boat (Steve Baker). At Aspen's Wheeler Theatre he appeared in The Seagull (Konstantin) and A Midsummer Night's Dream (Demetrius). Damon is a member of the LA-based Musical Theatre Guild, where he recently starred as Joseph Taylor, Jr. in Rodgers and Hammerstein's Allegro. Other highlights: My Fair Lady (Freddy) - Austin Music Theatre; Triumph of Love (Agis) - ICT; Forever Plaid (Frankie) – Granada Theatre; Camelot (Lancelot) - Cabrillo. TV/FILM: "Star Trek: Voyager," "Days of Our Lives," and "L.A. Confidential" (TV pilot). In early 2003, he makes his film debut as Harry McCarthy in Warner Bros/TNT release of "Gods and Generals". He appears regularly with Mora's Modern Rhythmists and is featured on the swing orchestra's most recent CD, "Goblin Market". Damon is a graduate of the Juilliard School. Built in 1932 as a destination for Los Angeles residents riding the Pacific Red Car, the Bathhouse offered a place to spend the day, rent a bathing suit and towel for ten cents, change, swim, shower and then return home. The Cabrillo Beach Bathhouse is the last standing example of the bathhouses that used to line southern California's shoreline. The Bathhouse and Boathouse, which was located on the inner beach, were both used during the 1932 Olympic Games for the boating events. 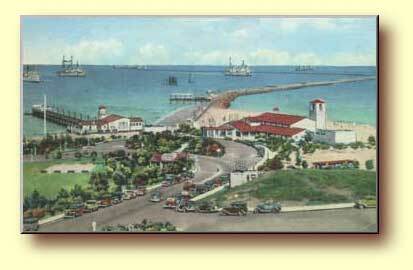 During the late 1930's and early 1940's the Bathhouse became the home of the Cabrillo Beach Museum. Shells and other sea life gathered by lifeguards and beachgoers were displayed on card tables. In 1950, Director John Olguin introduced educational grunion hatching programs and Grunion Run Hunts on the beach. At the same time, the Cetacean (whales) Society began a Whale Watch program. The museum continued to expand and a worldwide collection of shells and artifacts, ship models, maritime memorabilia, fishing, deep-sea diving gear, dioramas of sea life and large plaster mounts, models of giant octopus, black sea bass and a leatherback turtle were all part of the impressive displays. 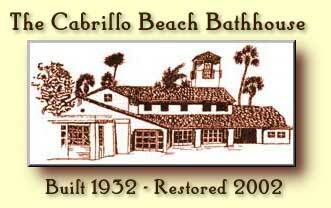 For more than 40 years, the Bathhouse was an integral part of marine activities at Cabrillo Beach. 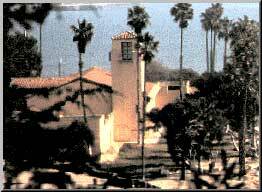 In 1981 the Cabrillo Beach Museum outgrew the Bathhouse and moved to its two present locations, The Cabrillo Marine Aquarium on the inner beach and the Maritime Museum on Harbor and 6th Street in San Pedro. During this period, the Bathhouse languished, falling into disrepair, its tile roof leaking and walls beginning to crumble. Pigeons took over the tower and much of the second floor ballroom with its beautiful beamed ceiling and hardwood floors. Due to the Bathhouse's deteriorated condition, it was left vacant except for storage for the Museums and use by the Cabrillo Beach chapter of the Polar Bears. The restroom and shower remained open for the public and were maintained by Los Angeles County. The most significant efforts to arrest its decay came through occasional film shoots, such as one for the movie "Face Off" which helped the ballroom look a bit like its former self. After the Northridge earthquake, seismic funds were used to remove much of the broken tile and add paper to the roof in an effort to secure it from further decay. Fortunately, during this period groups like the Cabrillo Beach Boosters, the San Pedro Bay Historical Society and the Polar Bears effectively lobbied for historical status for the Bathhouse. They also rallied members of the community and responsible agencies such as the local City Council office, Los Angeles Department of Recreation and Parks and the Los Angeles Harbor Department to keep the project moving. The efforts of local residents were invaluable. The building was declared a historic landmark but sat in disrepair for many years while the City searched for funding to refurbish it. Eventually, funding was provided through the City and the Los Angeles Harbor Department, which gave the largest portion, $2.1 million, with an additional 51.5 million from Proposition G. In the Summer of 2001, the public was able witness the groundbreaking ceremony when the building was emptied, fenced and partly demolished, marking the start of returning the Bathhouse to its original "as built" historic state. An historical consultant conducted extensive research, which included the original plans. An architect and contractor were hired and with the full support of the City of Los Angeles, restoration of the Bathhouse began. The renovation included the new tile roof, refinished original maple floors, original 1930s art deco paint and polished brass hardware. All structural and mechanical requirements were met, including earthquake retrofitting, plumbing - which includes hot water in the showers - electrical upgrades, elevator installation (to satisfy the Americans with Disabilities Act), landscaping, heating and air conditioning. On October 12, 2002, its 70th anniversary, the Bathhouse was re-dedicated. Mayor James Hahn, Congresswoman Jane Harmon and 15th District Councilwoman Janice Hahn spoke at the ceremony, which included representatives from the Department of Recreation and Parks and Harbor Department. The Pledge of Allegiance and singing of God Bless America were led by the 2002 Polar Bear King and Queen. 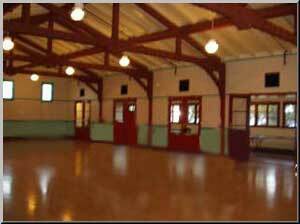 Now part of the Department of Recreation and Parks, the Bathhouse offers a variety of activities and classes. The upstairs Ballroom, Outdoor Patio Arcade Area and the 1st Floor Gallery are available for rent and to display art.